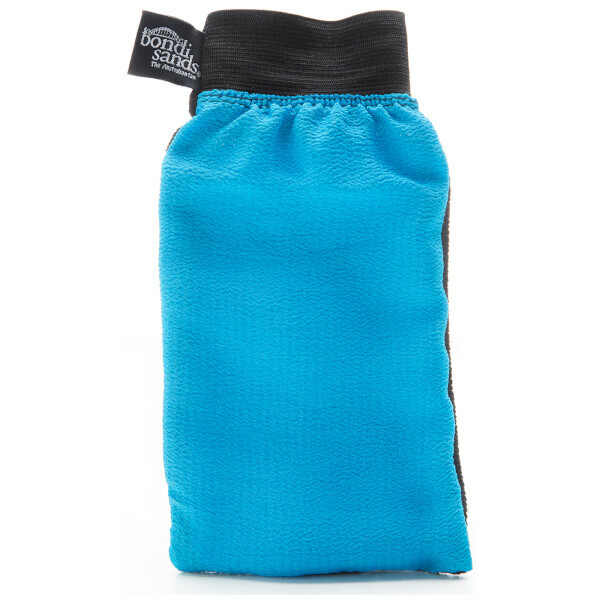 Ensure smooth, even tan application with the Bondi Sands Dual Action Exfoliating Mitt. The two-in-one tanning mitt uses one side to remove dry skin cells and self-tan residue, leaving a clean and clear base for your new golden glow. The other side erases the appearance of tanning errors such as streaks and patches, leaving a natural-looking bronzed complexion. The exfoliating mitt is kind and gentle on skin while leaving it soft and thoroughly invigorated. The result is an effortless, salon-worthy tan. Ensure skin is clean and soft by showering with warm, soapy water. Wet mitt and squeeze out excess water. For pre-tan exfoliation or removal of self-tan while in the shower use the black side and massage skin in a vertical direction, applying pressure. To correct tanning errors use the blue side to gently rub until unwanted self-tan disappears. Rinse mitt thoroughly and allow to completely dry before storing away.